The annual festival of films on transsexual themes is back in Bologna (Italy) for its 7th edition. I had discovered this festival only last year (2013) and found it to be a wonderful opportunity to challenge some of my prejudices and deeply held ideas about sexuality. This post presents some of the short and long films that I have seen so far in the festival. The festival of films on transsexual themes is organized by the Italian Movement of Transsexual (MIT) persons based in Bologna (Italy). I missed the films on the first day of the festival, as that day I was travelling back from Geneva and was too tired to go out. I also missed some films on the second day of the festival, as I had preferred to attend a symposium organized by the festival. Finally, yesterday, the third day of the festival, I could dedicate it to watching films. Here are some comments on the films I have seen in the festival. 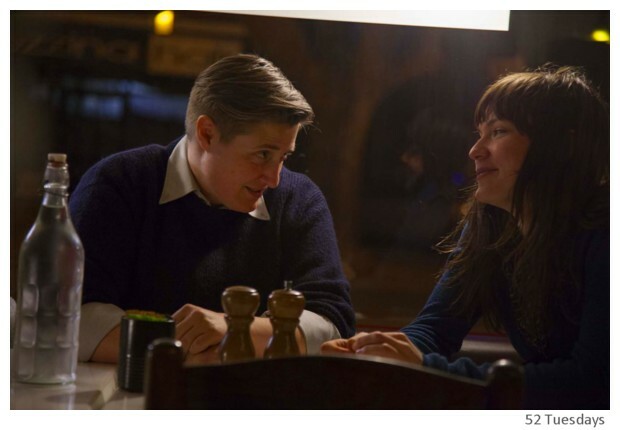 "52 Tuesdays" is a feature film by director Sophie Hyde, and is almost 2 hours long. The film is about a teenage girl called Billie (Tilda Cobham Hervey), who is making a video diary to share her feelings and parts of her life. Billie's parents are separated but are still friendly. Billie, who was very close to her mother Jane (Del Herbert Jane), is shattered when her mother asks her to leave home and to stay with her father Tom (Beau Travis Williams) for one year. Jane has decided to transit and become a man, and during this process, prefers not to have Billie around in the house. Billie refuses to accept this forced separation and finally her mother relents - they will meet every Tuesday for a few hours. The film tells the story of the changes in Billie and Jane's lives, through brief glimpses of those 52 Tuesdays spread along the year. It follows Billie's discovery of her own sexuality and friendship with her school mates Josh (Sam Althuizen) and Jasmin (Imogen Archer), and Jane's journey to become James. Jane's brother Harry (Mario Spate), who is also separated and lives with his sister, and Billie's father Tom, are the other two key figures in the film. It is a coming of age story about Billie and her final acceptance of the choices made by her mother. At the end it is Tom who makes Billie understand her mother, "You are the person he loved most. He did not want to break the close bond that both of you had. Because of you, he waited so long to become the person he felt himself to be. Inside, he is still the same person, your mother, who loves you more than anyone else. Would you have preferred that he continued to hide and not be what he felt inside?" The film focuses on relationship issues between Jane/James and Billie, and does not go into prejudices and social discrimination around the issue of changing gender identities in Australia. Tom is almost too good to be true, very understanding and supportive about his ex-wife. Harry, on the other hand, is a more complex character. I think that if transgender parents decide to initiate transition when their children are adolescent (and entering a problematic life phase), the parent-child relationships are likely to become even more complicated. It would be easier if the transition occurs when the child is younger and can better accept the changes. Or, it may be slightly less complicated, if the child is grown up and mature. The film explains Jane/Jame's reason (the strong bond with his daughter), for not transitioning earlier and thus becomes an opportunity to explore the impact of such a decision on an adolescent. The film stimulated some questions in my mind - Would it be more difficult for a child to accept a FtM mother or a MtF father? How will the gender of the child influence this acceptance? For example, would it have been easier if Billie had been a guy? I am not sure how all these variables would influence the parents-children relationships and if any general conclusions can be drawn about them. The most difficult parts of this film for me were those related to Billie's exploration of her sexuality with Jasmin and Josh. These scenes created a strong feeling of unease in me, and were probably determined by my Asian/Indian upbringing in the 1960s-1970s where adolescents, especially girls, experimenting with their sexuality, would have been culturally unacceptable. Thus, the easy acceptance of Billie's sexual explorations by her parents in the film, made me feel as some kind of old fashioned and retrograde person. Filmed actually on 52 Tuesdays with non-professional actors, film does seem a real-life video diary, and not a make-believe world. Both Tilda and Del Herbert give authentic performances as Billie and Jane/James. You can watch the film's trailer on the film website. This is a short film (12 minutes) and its original title is "Bajo el ultimo techo". The film is about Beto, who lives with his grandparents while his mother has gone off to live in India. One day a new person, Stephania, comes to live in the apartment next door and Beto discovers a fascinating world of art and play in her house. Quickly they become friends. One day, Stephania tells Beto that when she was young, she was a boy like him and inside her two persons lived - the boy Esteban and the girl Stephania. 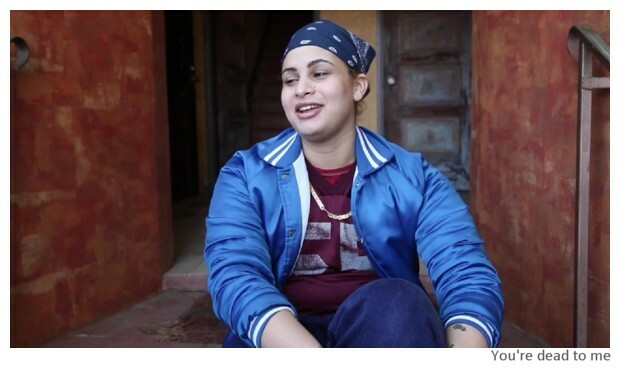 The social prejudices against the transgender persons force Stephania to leave the apartment. To say goodbye to his friend, Beto escapes from his apartment and climbs to the top terrace of the building. It is a simple and uncomplicated film that focuses on children's easy acceptance of those who are different. You can watch the trailor of this film on Vimeo. 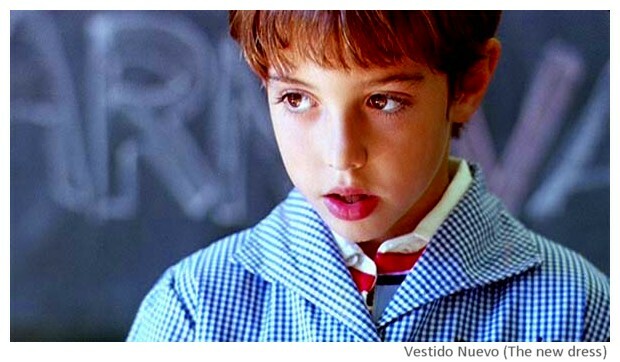 The original title of this short film (14 minutes) by director Sergi Perez is "Vestido Nuevo" and is a very moving film about the relationship between a father and his son who wants to dress up as a girl. The film tells the story of a carnival day in a school. Children are supposed to dress up as the Dalmata dogs but Mario comes dressed up in his sister's pink frock. The principle calls Mario's father to the school. The film with its surprise ending brought a node to my throat. I think that the film is very manipulative with an absolutely adorable boy - like his father, you can't but love him and yet pity him for his desires because you know that the world will be ruthless with him. The film makes you feel hopeful - even if the world will be cruel to your child, you can make sure that he/she can always count on your love and acceptance. Therefore, in spite of its manipulativeness, I think that the film is very effective and should be obligatory for all parents, especially for the fathers. You can watch the full film on Youtube with subtitles in English (Thanks to Rohini for the link) - it is a film that will not fail to touch you! This short film (10 minutes) based in a Latino family is by American-Chinese director Wu Tsang. The film is about a Maxican woman Andrea (Laura Patalano) and her preparations for the "Dia de los muertos" (the day for remembering dead persons), and the visit of her estranged daughter (Harmony Santana) who has chosen to become a man (Gabriel). 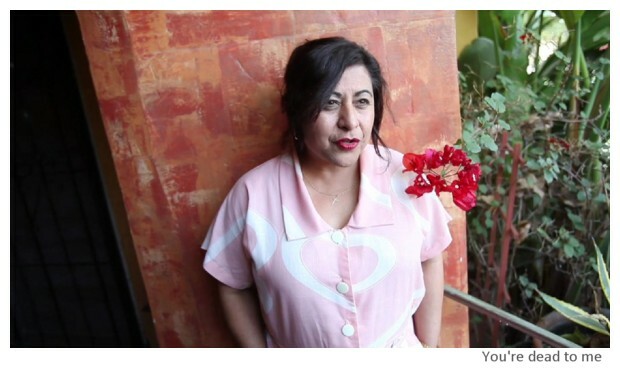 Gabriel no longer lives with his mother, because of her fear of social backlash. They can only meet secretly. "Where is my lucky cap?" Gabriel asks. "How much did I love you as my daughter", Andrea tells Gabriel, asking him to wear the white long dress and become a daughter for a short while, "You do that and I promise to give you, your lucky cap." Hidden and forced into a gender role that he does not want, Gabriel is the ghost that has come to visit his mother on the day of the dead. The film mixes reality and imagination in a clever way to drive home its point about accepting your children as they are and not to give in to social pressures. It is my "number one" film from this festival so far and I strongly recommend it. Both the actors, Laura and Harmony are wonderful. Their way of speaking in mixed Spanish and English reminded me of our own mixing of Hindi and English in India. You can watch a trailer of this film on Vimeo. The international festival of Trans films is a great opportunity to see the films that are normally ignored on TV and cinema halls. From the first group of films, my favourites were "You're dead to me" and "Vestido Nuevo". I also hope that my comments will encourage you watch these films, at least some of them! Even if you can't watch the full films on Youtube or Vimeo now (except for Vestitdo Nuevo), sooner or later they will become accessible on internet. Thanks for sharing this..I will surely watch all these movies. Its such a progressive step. I hope one day the issue of gender doesn't remain an issue at all..we have to open our eyes and our hearts.